As we come close to the end of the year it’s good to feel that there have been some achievements to protect the environment in the ACT. It;s great there are people who recognise and work on issues, looking after places and matters that are important to us now or into the future. And while Governments can be a problem (can’t live with them, can’t live without them?) there are good public servants who really do care and Ministers and MLAs who really try to do things better. So welcome to our warm springtime report on some of our recent activities and other events coming up in the region. Our annual Spring Mingle is coming up on 27 October, we look forward to celebrating with you. The Spring Mingle is our way of making a space to say thank you to the many people who make contributions to protecting the environment in the ACT. Part of the way we do this is to announce the Conservation Council’s 2017 Environment Awards 2017. Thank you for the nominations, they are being judged to be announced at the Spring Mingle. The first steps of our Walk the Border ACT fundraising event took place Saturday 7 October at the Centenary Trail Track Head in Hall and the Walk is now well underway. You are still welcome to join as a walker or support the walk through sponsoring a walker. Or you can join the mailing list for updates. Our Environment Exchange series of lunchtime dialogues has been very popular this year and we have only one more session to go: Biodiversity offsets in the ACT – are they working, how are they being managed? Last Environment Exchange 2017 — biodiversity offsets: are they working in ACT? And there’s more events below including an exciting Food Sovereignty Convergence taking place in Canberra and a butterfly walk with Friends of Black Mountain. Please forward this Yellow Box Dispatch to people who might be interested in reading it or looking at the pictures. Join us to celebrate our environment achievements at the 2017 Spring Mingle, Friday 27 October 2017 from 6pm, at the Renewables Innovation Hub, 19 Moore Street Turner. Connect with other Canberrans who are passionate about the environment, and celebrate the announcement of the 2017 ACT environment awards. There will be a bar, music, entertainment, a silent auction and we will provide lovely food as usual. We will also celebrate the end of Walk the Border ACT. We look forward to celebrating with you! Please book now to help us with our planning and catering. Entry is by donation. (Pictured is part of the 2015 Spring Mingle and announcement of the Environment Awards). For further information contact [email protected]conservationcouncil.org.au. The Walk the Border ACT – A Watershed Walk is a fundraising walk that will complete a full circuit of the ACT’s border over 21 days starting 7 October 2017. A 306 km walk that crosses ancient pathways and defines the Australian Capital Territory, Walk the Border ACT is seeking to raise funds for the Conservation Council ACT Region. The walk also offers a rare opportunity to raise community awareness about the breadth of the ACT’s ecosystems and the many cultural aspects associated with the landscape. What is a fundraising walk without donations? Walk the Border ACT is seeking to raise funds for the ACT’s peak environment body, the Conservation Council ACT Region. The Conservation Council has been a major force in the protection of the ACT’s urban and natural environments though lobbying, campaigning educating for more than 37 years. As a non-profit, non-government organisation, every donation to the Conservation Council, no matter how small, is important. Not able to join the walk itself? There are opportunities for volunteers to help with the running of the walk. Tasks include picking up walkers at the end of a stage or helping in managing the communications around the walk? Contact Walk the Border ACT on [email protected] to find out how best to help. The more people that know about the walk the more likely we will be able to tell people about our work and for them to make contributions. So let all your friends and family know about ourblog site and Facebook page and encourage them spread the word as well. More information at the website and email[email protected] with any questions. Walk the Border’s successful launch at the Namadgi Nation Park Visitor centre was featured in the Canberra Times – see the article here. Pictured are the Conservation Council Executive Director Larry O’Loughlin, left, with Minister for the Environment Mick Gentleman, and President Rod Griffiths, who leads a 306 kilometre circuit of the ACT’s border. The first steps of Walk the Border ACT fundraising event took place Saturday 7 October at the Centenary Trail Track Head, corner Hoskins and Hall Streets Hall. It’s not too late to join the walk! See details for best days to do part stages to join for a day or more here. Have a look at them in conjunction with the descriptions in the walk schedule to see which might best suit your personal requirements. And then you can register here to become a border walker. Canberra is a national and international leader on local climate change action and delivery and we are proud of this. We are leaders because we have: a 100% renewable energy target by 2020; a 40% reduction target by 2020; plans and contracts in place to deliver these targets. We also have a target of being zero net emissions by 2050 and we have tri-partisan support for all of these things. Our climate policy is working. In 2010 the ACT Government set greenhouse gas reduction targets and started to invest in renewable energy. As at 2017 already over 40% of our electricity is from renewable sources and we are on track to deliver 100% renewable electricity by 2020. Our greenhouse gas emissions have dropped 11.8%! We seem to be going from strength to strength. However, this local momentum for local action on climate change has been community driven and it needs to be maintained. Environment and community groups have been raising awareness going back over two decades including the November 2015 People’s Climate March prior to the Paris meeting for the United Nations climate summit. Hundreds of thousands turned out globally and in Canberra we had 10,000 people – Canberra’s largest ever climate change rally. A key factor of this turnout was it wasn’t just an environment rally – it was attended by a diverse range of peoples, including firefighters, faith communities, unions and workers, farmers, health professionals, business people, artists and musicians. It was a colourful and family friendly event. If we are to develop and implement a zero net emissions plan it must be embraced by the ACT community, by a wide range of organisations across sectors and by our major political parties. Effective community ownership will be an essential part of delivery of our zero net emissions goal. However post-2020 there is no plan to achieve the zero net emissions target by 2050 and there are no interim targets. While the Government has clearly stated its intention to make further moves on climate change there has been little visible progress since the 2016 election. There is a particular looming challenge of dealing with emissions from the transport sector. The transport sector will be the ACT’s single biggest contributor to greenhouse emissions after we move to 100% renewable electricity. We need to work together as a community to develop agreed pathways on climate change that work for all sectors of society to ensure a just transition to adapt to climate change by developing further responses in consultation with climate affected communities and workers. The pathway to zero net emissions will be and needs to be community driven. Minister for Climate Change and Sustainability Shane Rattenbury has indicated that in the near future he will bring forward development of a post-2020 plan. While it will be important for the Government to develop strategies and systems the big challenge will be to build on community ownership of the vision and pathway for a zero net emissions Canberra as soon as possible. Sign up here if you want to be kept up-to-date on our local action to address climate change. The Conservation Council ACT Region has accepted the invitation to join the Stop Adani Alliance. The Alliance is one part of the overall Stop Adani campaign and currently has over thirty organisations as members, with a combined supporter base of over two million people. Thecurrent membership of the Alliance includes the Australian Conservation Foundation, 350.org, AYCC, Nature Conservation Council of NSW, Conservation Council South Australia, Conservation Council WA and several Queensland Conservation Councils. The Board has agreed to joining the Alliance because the Conservation Council’s aims, objectives and values Declaration are in line with the Alliance Declaration; Conservation Council membership of the Alliance helps strengthen the overall alliance and joins us with a range of other conservation, environment, faith and community organisations, and; membership of the Alliance is free of charge yet also provides access to some campaign resources. The grounds of opposition to the proposed Adani coal mine are set out in the Alliance Declaration (below). Member organisations all endorse the Stop Adani Alliance Declaration, not every single moving part of a diverse campaign. THE TIME FOR RIDING ROUGHSHOD OVER INDIGENOUS RIGHTS IS OVER. THE TIME FOR BUILDING NEW COAL MINES IS OVER. THE TIME FOR ACTION TO STOP ADANI IS NOW. If you would like to know more about the Conservation Council joining the Alliance contact [email protected]org.au More information on the Alliance is available at the Stop Adani Alliance website. If you would like to be involved in Stop Adani actions in the ACT contact the 350.org Canberra team [email protected] or attend a 350.org meeting on the first Wednesday of each month from 5:30pm-7pm at the Conservation Council ACT Region office – Barry Drive. All are welcome! Our Environment Exchange topic for September was environment, planning and sustainable development issues in the ACT with a speaker from the ACT Government Environment, Planning and Sustainable Development Directorate (EPSDD). Ben Ponton, Director General EPSDD, was unavailable to attend this event at late notice. We were pleased to be joined instead by Acting Deputy Director-General Geoffrey Rutledge. Our Environment Exchange got off to an exciting start with our guest speaker, Geoffrey, rushing in to join us from attending a cabinet meeting. Rutledge ended his presentation with an anecdote highlighting the biodiversity of our region and the importance of community consultation. As when the little eagle nesting pair returned to Strathnairn, all sectors of the Directorate came together to protect this endangered species. This is what the Directorate aims to achieve with their community consultation, bringing all areas together to create the city we want to live in. To do good community consultation will require different conversations in order to reach the disinterested and time poor. As Rutledge noted, this was initiated with the echidna love trains at Mulligans Flat being hash-tagged the Bachelorette on social media. Therefore the Directorate is aiming to spread out and connect with difficult-to-engage ACT residents and as a result creating a new conversation on environment, planning and sustainable development issues in the ACT. A big thank you to our wonderful volunteers (pictured) who made this (and other events) such a success. We can’t do our work as the community’s voice for the environment without you. See a summary of the event and find out more at our Bush Capital Blog. If we had a chance to start anew we probably wouldn’t enforce gas infrastructure for every residence. Would we? Natural gas is basically methane and it produces greenhouse emissions when it burns (and it’s even worse if it just leaks into the atmosphere) and most of us recognise that climate change is going to get worse if we keep adding emissions. Indeed, in the ACT we even have a policy of having zero net emissions by 2050 at the latest so surely gas is on the way out. Some developers have seen the writing on the wall and want to build suburbs without the requirement that all residences have gas infrastructure at the property boundary. Why spend millions of dollars on pipes and valves and taps when we are trying to build more affordable houses? Why build it if no-one will use it? This infrastructure will become stranded assets: assets which are obsolete or non-performing and never able to make back the cost of their installation. Now let’s look at what’s happening in the ACT. It is currently a mandatory requirement for development in Canberra (Territory Plan, Estate Development Code, p14) that gas be provided to each block. Riverview Developments (undertaking the Ginninderry development that will traverse the ACT-NSW border at West Belconnen) wants to have suburbs without gas. The gas supplier ActewAGL (part-owned by the ACT Government through Icon Water) argues that gas infrastructure should be installed. They say that there is a future for gas, if not natural gas it might be biogas (available in limited supply and still an emitter) or syngas (produced from waste or coal or biomass and potentially more available but much dirtier and still an emitter). The decision-maker will be the ACT Government. They should decide, very soon, between the views of ActewAGL and the views of Riverview wanting to start building infrastructure (but not gas) for tens of thousands of homes. And that decision will show if the Government is serious about reducing greenhouse gas emissions. If they want to have zero emissions they will not be cooking with gas. Conservation Council was briefed on the Utilities (Technical Regulation) Amendment Bill 2017, which has been presented to the Assembly by Minister Rattenbury for debate in October. The Bill looks at vegetation management around power lines and poles to reduce the risk of the infrastructure starting fires and also to protect the infrastructure in case of fires. The proposed amendments will change shift the responsibility for tree clearing from Transport Canberra and City Services to ActewAGL (or any other future network utility), as the network operator, while establishing new protections to avoid unnecessary and excessive clearing of vegetation. The process looks broadly acceptable, with clear responsibilities, significant roles for the Conservator, easier application of fines for non-compliance, and a codified guidance for how and when vegetation can be cleared. However it will be important to look at the detail of the proposed Technical Code which would be developed before the legislation would be implemented. If member groups want to be consulted on the technical code or want more detail on the Bill please contact [email protected]org.au. The Bill will be debated in late October. Thank you to Minster Rattenbury for facilitating and the TCCS and EPSDD Directorates officials for providing the consultation. The Conservation Council wrote to Minister Fitzharris 11 September expressing concerns with the Tree Protection Amendment Bill 2017 presented 24 August 2017. We also copied in Liberal and Greens MLAs. The Amendment Bill would allow for easier removal of urban trees. The Amendment Bill would limit standing for review of the approval, refusal to approval, cancellation or refusal to cancel the registration of a tree. We were also concerned about the additional responsibilities loaded on to the Conservator without clear statutory guidelines. As we have pointed out the ACT Government does not always have well-qualified Conservators, such as the current Conservator Annie Lane, so all Conservators should be provided with guidance. Ironically since that time we have learned that Annie Lane will be retiring as Conservator and from ACT Government at the end of 2017. She has given Conservators a good name and will be missed. Neither the Conservation Council nor the Environmental Defenders Office (EDO) had been contacted for consultation or briefing on the Bill. Since our letter to Minister Fitzharris debate on the Bill was withdrawn from the September sitting, both the Liberals and the Greens have been provided briefings. The Conservation Council and the EDO were briefed in the first week of October and while it was a good briefing some of our concerns remain. The Nature Conservation (Minor Public Works) Amendment Bill was presented by Minister Gentleman to the Legislative Assembly on 14 September. It proposes to make changes so that the Parks and Conservation Service does not have to submit a DA for every minor work and have the Conservator of Flora and Fauna prepare an Environmental Significance Opinion (ESO) for minor works. Instead the Conservator would prepare a ‘minor public works code’ and all proposed works would comply with that Code. This process would seem to work as it would apply to repairs or straightforward replacements and genuine minor works. The proposed code would be a disallowable instrument so there is theoretically more scrutiny and transparency. It might be useful that public servants can operate more efficiently and operate against rules (namely the Code) rather than have to follow time-wasting processes which in effect do not provide any more protection or scrutiny. The Conservation Council was briefed on the Bill before the Bill even went to the Assembly and we have been offered consultation on the Code as it is developed. We were even listened to as we raised points. From our point of view that is a good consultation process. If you would like to know more on the Bill or be involved in the consultation on the Code please contact [email protected]org.au. The Bill will be debated in late October. Thank you to Minster Rattenbury for raising the issue and then to Minister Gentleman for facilitating the consultations with EPSDD officials. The Conservation Council has produced a briefing paper – Going backwards on reducing ACT’s waste – on some key “fails” by the ACT, especially the Government, on reducing ACT waste. We are concerned that the Government is encouraging the establishment of waste incineration through waste to energy facilities to deal with failures to achieve key targets in waste minimisation and waste management. Waste-to-energy: ACT Government to say no to current Capital Recycling Solutions proposal; develop a clear set of guidelines for considering waste-to energy proposals including a requirement that it is only a “last resort” measure. Waste Feasibility Study: to have a strong focus on waste reduction. See the key fails on waste minimisation and management here. Conservation Council ACT Region made a submission in September 2017 to the ICRC on Icon Water proposals for water and sewerage tariffs 2018-2023 prepared by Emeritus Professor Ian Falconer, Board member, Conservation Council ACT Region. The Conservation Council has a long-standing role in commenting on tariff charges for water supply and use. In collaboration with the ACT Council on Social Service (ACTCOSS), the Conservation Council supported a dual rate charging system at the last review five years ago, which resulted in which low use customers supplied with water at a rate well below that charged to larger users. Following the draft ACT Independent Competition and Regulatory Commission (ICRC) proposals for water charge revision in March 2017, a submission was delivered to the ICRC that strongly opposed the ICRC’s proposed new tariff structure from 2018, on the basis that it progressively transferred the costs of the utility to small domestic users and householders, while saving substantial costs to big consumers. This submission has now reviewed the new Icon Water paper on tariffs for the next period, which are more in-line with the intentions of the Conservation Council than the earlier proposals from the ICRC. Icon Water’s proposal supports a dual tariff structure while appreciating that the utility is required to balance its finances and repay capital expended on ensuring supply in drier times. The relatively modest increase in supply charge reflects the major component of water supply costs, which are those from infrastructure and capital, rather than the actual cost of a volume of treated water. The dual tariff is proposed to be continued with close to ‘cost of living’ increases in cost per unit of water volume supplied (KL). The two points requiring further evaluation in the Icon Water proposal are the large return on capital, which is quoted at 26%, and the ‘Uneconomic Bypass’ provision. While profit from Icon Water passes to the ACT Treasury as owners – thus being set against Canberra’s rates – this capital return appears excessive, leading to unnecessarily large profits. The other issue is the open-ended nature of the new ‘negotiated contracts’ provision for high volume users who have potential for alternative water sources, such as pumping from Lake Burley Griffin. This is currently unspecified by volume, and could comparatively disadvantage other users since the decrease in income is passed on as increased costs to other consumers. The parameters for these contracts need specification. Overall the Icon Water proposals are sensible, and avoid the major social disadvantages of the earlier ICRC draft. They are welcomed. Environment Exchange events are held monthly to provide for informed, in-depth discussions on environmental issues in the region. Member groups are encouraged to attend and to publicise the events to their members and supporters. The Conservation Council ‘Environment Exchange’ series is held at the Renewable Energy Hub, 19-23 Moore Street, Turner (just off Barry Drive). All events are scheduled from 12-2pm starting with a light lunch (donations welcome). The first series for 2017 resulted in lively and productive discussions with all events being well attended with good food and interesting conversation. To see the summaries check out our blog posts. We saved the best till last: Tuesday 24 October: Biodiversity Offsets – are they working in the ACT? Enjoy a lunch, tea and coffee while networking and questions from, and discussion with, the audience. Click here to find our more and reserve your place or call us on (02) 6229 3200. Please forward this to people who might be interested in attending and encourage them to book online to reduce food wastage and stress. WHAT: Come along and celebrate the rejuvenated Downer shops! Loads of stalls and fun activities for the whole family. SEE-Change is running a Sewing Repair Cafe, so bring along some favourite items that need repair and we’ll teach you how! Join in the fun at the seed bombing workshop, learn how to set up a wicking garden plot and a worm farm. Lots of food and fun for everyone! REGISTER: No need! Free and welcome to everyone. WHAT: In conjunction with Strathnairn Arts Open Day, SPRINGFEST will be held at The Link 14 October 10am-5pm. From performing artists and handmade crafts to a puppet show, choir performance and a footy clinic, this social and community event will keep the whole family entertained! Join us for a day of earth-friendly markets, hosting local makers who use sustainable materials and methods, as well as pre-loved treasures. Plus there will be great food and plenty of entertainment. REGISTER: Free event, more information here. WHAT: Join us for breakfast on Wednesday 18 October, and hear a thought-provoking panel discussion on hidden poverty, as part of 2017 Anti-Poverty Week. The panel will be emceed by ANU academic, Dr Kim Huynh, and will feature ACT Community Services Director-General, Michael De’ath, ACT Education Director-General, Natalie Howson, and A/g Deputy-Director General, Innovation ACT Health, Mary Wood. REGISTRATION: Free event, please register online here. WHAT: Add new flavours to your palate and foster an appreciation of edible natives often found in the Canberra region with Bent Shed Produce’s Fiona Porteous. Fiona is an avid foodie who grows and uses native plants in her everyday cooking. This hands-on workshop will show you how easy it is to incorporate edible natives in simple dishes. BOOKINGS: Tickets can be purchased online here. More Events from Canberra Environment Centre on theirwebsite here. WHAT: Butterflies have been described as “an inexhaustible of spiritual and aesthetic delight”. They have a practical value as well. We all love sunlight, and we owe many glorious and sweet-scented flowers, at least those of long tubular form, to the butterflies and moths that pollinate them. Join our local expert, Suzi Bond to see and hear about butterflies and the plants they like near the summit of Black Mountain. It will be a generally easy walk with some steep sections followed by light refreshments. WHERE: Lookout Terrace slightly uphill from Telstra Tower on Black Mountain (see balloons). BRING: Bring: Friends and family. Binoculars to see the butterflies more clearly if you wish. Water. Snacks if you wish. ‘Gold Coin Donation’ to Friends of Black Mountain. Wear: Sturdy walking gear, including hat and stout shoes. 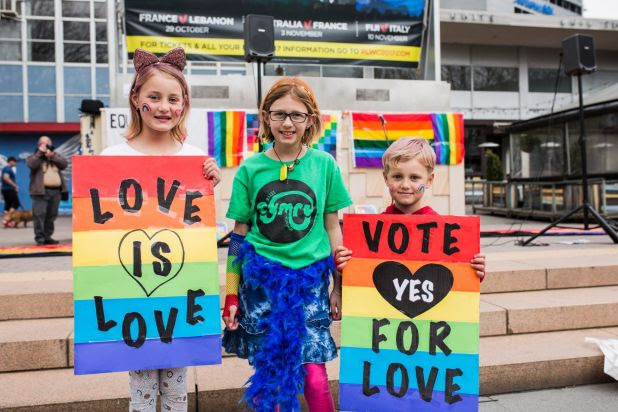 WHAT: On September 2, we had the largest rally for LGBTIQ+ rights in Canberra’s history. On September 10, 50,000 marched in Sydney, while tens of thousands have rallied in Melbourne, Brisbane and Adelaide. Now’s the time! Join us to stand for LGBTI rights and equality and to make this the biggest, most vibrant rally yet. As the plebiscite continues it’s more important than ever that we stand with one another and keep the pressure on to at long last win marriage equality in Australia! INFO: See the Facebook event here for more information. WHAT: Two days of debate, stories, analysis, sharing, strategising and planning, all in the cause of building a fair food system for all Australians! Farmers, consumer advocates, right to food activists, urban agriculturalists, educators, communicators, innovators – whoever you are, wherever you’re from – if you see yourself as part of Australia’s food sovereignty movement, this is for you! WHERE: Burringiri Cultural Centre, 245 Lady Denman Drive, Canberra, ACT, 2602. REGISTER: Purchase tickets and check out the exciting program here. WHAT: Peter Dombrovskis was one of the world’s foremost wilderness photographers. His powerful, reflective and deeply personal images of the unique Tasmanian wilderness had a lasting impact, changing the way Australians think about their environment. The Library has over 3,000 Dombrovskis transparencies, and has printed 70 of the best for this exhibition, the most complete survey of his work to date in Australia.